Nepal Foreign Affairs (Chipledhunga, 3 March 2019)- Tourism entrepreneurs in Pokhara have demanded that the under-construction Pokhara International Airport be named after late Civil Aviation Minister Rabindra Adhikari. Issuing a press statement, Chiranjibi Pokharel, Chair of the Pokhara Tourism Council, an umbrella organisation of tourism entrepreneurs, have called the airport to be named ‘Rabindra international airport’ in recognition of his contribution to the civil aviation and tourism sector. Adhikari died in a helicopter crash on February 27. 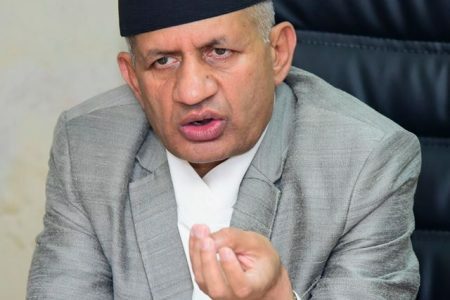 As member of then parliamentary public accounts committee, development committee and as coordinator of the high-level airport construction committee, Adhikari played a significant role in realizing the construction of the Pokhara regional airport, adds the statement while mentioning his special role as the Minister for Culture, Tourism and Civil Aviation until the unfortunate incident.